This article is about the geographical region of northern Minnesota and Ontario. For the wilderness area within the region, see Boundary Waters Canoe Area Wilderness. For an overview of political water boundary laws, see international waters. The Boundary Waters, also called the Quetico-Superior country, is a region of wilderness straddling the Canada–United States border between Ontario and Minnesota, in the region just west of Lake Superior. This region is part of the Superior National Forest in northeastern Minnesota, and in Canada it includes La Verendrye and Quetico Provincial Parks in Ontario. Voyageurs National Park in Minnesota may also be considered part of the Boundary Waters. The name "Boundary Waters" is often used in the U.S. to refer specifically to the U.S. Wilderness Area protecting its southern extent, the Boundary Waters Canoe Area Wilderness. 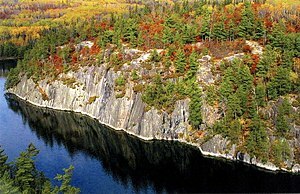 The Boundary Waters region is characterized by a vast network of waterways and bogs within a glacially-carved landscape of Precambrian bedrock covered in thin soils and boreal forests. The Boundary Waters is a popular destination for recreationalists pursuing camping, canoeing, and fishing as well as for those simply looking for natural scenery and relaxation. The area is one of several distinct regions of Minnesota. The following communities are located anywhere from two to twenty miles from the boundary waters: Ely, Cook, Grand Marais, and Tofte in Minnesota and Atikokan in Ontario. Protected areas in the Boundary Waters region in Minnesota include Superior National Forest, Boundary Waters Canoe Area Wilderness, Voyageurs National Park and Grand Portage National Monument. Protected areas in Ontario include Quetico and La Verendrye provincial parks. This page was last edited on 17 February 2019, at 20:59 (UTC).